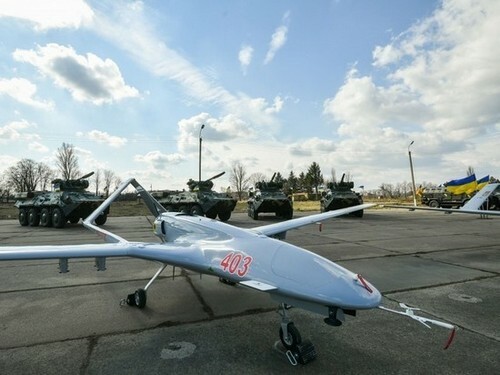 The Armed Forces of Ukraine officially adopted the Bayraktar TB2 assault unmanned aerial vehicles of Turkish origin. On the successful testing of new machines, said President of Ukraine Petro Poroshenko on his page on social networks. In the same place photos of devices are placed. “We now have a completely new weapon – the drone drone. You see the camera that works directly on the drone, you see the accuracy of the hit, ”Poroshenko wrote. In his words, the drones will strengthen the Ukrainian defense in “confronting the Kremlin’s brutal aggression.” He added that the drones will be sent to the conflict zone in the Donbas. As reported by MK, military expert Denis Fedutinov, the photo shows one of the first Turkish UAVs transferred to Ukraine, the contract for the delivery of a batch of which from six units (2 aircraft each in the complex) worth $ 69 million was signed last year. “Thus, Ukraine has become the second foreign operator of this unmanned system after Qatar,” said the expert. – The original version of the device was close in dimension to the Israeli Searcher Mk II, operated, including by the Russian Armed Forces under the name “Outpost”. However, the samples arrived in Ukraine represent a more difficult version with a take-off weight of about 650 kilograms. In addition to optoelectronic surveillance equipment, the drone can carry weapons. For example, two anti-tank guided missiles MAM-L or L-UMTAS, as well as two adjustable air bombs with a semi-active laser homing head MAM-C developed by the Turkish company Roketsan, located on 4 external suspension points. The device can fly for up to 24 hours, but the lack of a satellite communication channel limits the range to about 150 km, the expert said. In turn, the former militia, who fought in the army of the DPR, told “MK” that the Turkish drones did not threaten the army of the republic. “This technique is suitable for fighting partisans who do not have anti-aircraft defense,” he said. – Similar devices are clearly visible on the radar of the air defense system “Osa”, which were captured by Donetsk troops from the Ukrainian army in 2014-2015. Opportunities DNR will track this drone and destroy in advance. Bayraktar TB2 was used by the Turkish army in operations against the Kurds. One unit was shot down by partisans, another crashed for technical reasons. During the conflict in the Donbas, the troops of the LC and the DPR managed to shoot down 34 aircraft, helicopters and a drone of the Ukrainian Air Force. Large losses in technology forced the command of the Ukrainian army to withdraw manned aircraft from the conflict zone.